The United Soccer Leagues announced on Tuesday that Boca Super Y-League standout Joseph Sorrentino has been named Super Y-League National Player of the Week for week 10 of the 2004 season. Sorrentino scored 4 goals for the Boca U16s to upset DC United on Sunday at the Manchester Soccer Complex. 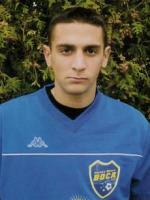 TAMPA, FL (June 23, 2004) – The United Soccer Leagues announced on Tuesday that Jersey Shore Boca Super Y-League standout Joseph Sorrentino of Hamilton, NJ has been named Super Y-League National Player of the Week for week 10 of the 2004 season. Sorrentino scored four goals, two of which were unassisted for the Boca U16 Super Y-League team as they upset perennial powerhouse DC United 4-1 on Sunday June 20th at the Manchester Soccer Complex. With the upset win, the Boca U16 SYL team improves to 2-2-0 for the season placing them in a tie for fourth place with Chesapeake Athletic in the Super Y-League’s U16 Mid-Atlantic Division. Sorrentino has now compiled 15 goals and 7 assists for the 2004 SYL season between his time with both the Boca U15 and U16 SYL teams. The goal scoring forward was also recently accepted into the US National Teams residency program at the IMG Academy in Bradenton Florida and will take-up his full-time residency with the US Under-17 National Team in September. This is the fourth time in the club’s four-year Super Y-League history that Boca players have received national recognition from the Super Y-League. The league has previously honored former Boca SYL players Chris Konopka (Toms River) and Jara Habib (Marlboro) with National Player of the Week recognition during the 2001 and 2002 seasons respectively. Also, at the conclusion of the 2003 season, eight Jersey Shore Boca players, including Sorrentino, were named to the 2003 Super Y-League Regional ODP Player Pool. Jersey Shore Boca has fielded a record six Super Y-League teams during 2004, the highest number ever in its SYL history. All of Boca’s 2004 SYL teams compete in the historically tough Mid-Atlantic Division in the Northeast Conference along with some of the top youth soccer clubs in the United States this season including DC United (DC), Northern Virginia Royals (VA), Baltimore Bays (MD), The Chesapeake Athletic Club (MD), Super Nova SC (PA), South Jersey Barons (NJ) and Reading Rage (PA) among others. For more information on the Jersey Shore Boca Super Y-League teams including complete standings and schedules, visit the Club’s official web site at www.jerseyshoreboca.com.